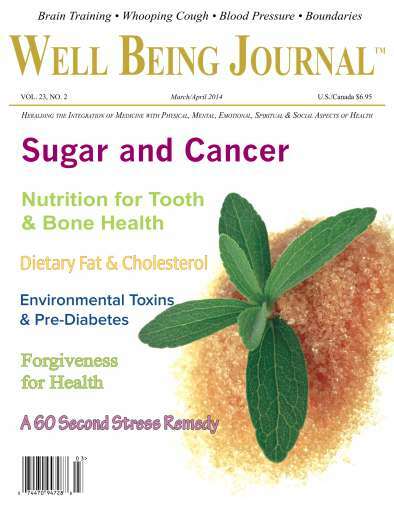 The March/April 2014 issue of the Well Being Journal presents clear evidence that sugar in the diet may contribute to major illnesses such as cancer; and that when cancer cells are deprived of sugar; they die. Other cells in the body; such as those in teeth and bone; as you will see in “Nutritional Remedies for Tooth Decay and Bone Health;" show signs of healing when the diet is low in sugar and high in nutrients such as fats; proteins; vitamins; and minerals. Nutrition is not the only factor determining the health of cells in the body; and this issue of the Journal provides excellent features about reducing stress; setting boundaries; and practicing forgiveness. All of this and much more; including our scintillating health note features.